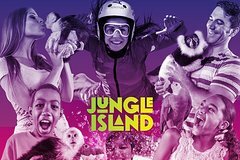 Enjoy one day of access to Jungle Island, its spectacular shows, unique animal exhibits and fun children's play area, all set among a lush, tropical environment. Jungle Island is home to animal wonders including lovable lemurs from Madagascar, the only tame cassowary on the planet, parrots, twin orangutans - Peanut & Pumpkin - and much more. In addition, take part in memorable experiences including a visit down under with the Australian red kangaroos and feeding of animals at the petting farm. Featuring NEO Splash, our new pop-up inflatable mega water slides activation. Wet, wild and included in your general admission!